I like music with a distinctly electronic edge, but also want a human "feel." Trying to resolve these seemingly contradictory ideals has led to some fun experimentation, but one of the more recent "happy accidents" was finding out what happens when you apply heavy signal processing to multitracked drums played by a human drummer. I ended up with a sound that slid into electronic tracks as easily as a debit card slides into an ATM machine, yet with a totally human feel. This came about because Discrete Drums, who make rock-oriented sample libraries of multitracked drums (tracks are kick, snare, stereo toms, stereo room mic tracks, and stereo room ambience), received requests for a more extreme library for hip-hop/dance music. I had already started using their CDs for this purpose, and when I played some examples of loops I had done, they asked whether I'd like to do a remixed sample CD with stereo loops. Thus, the "Turbulent Filth Monsters" project was born, which eventually became a sample library (originally distributed by M-Audio, and now by Sonoma Wire Works). Although I used the Discrete Drums sample library CDs and computer-based plug-ins, the following techniques also apply to hardware processors used in conjunction with drum machines that have individual outs, or multitracked drums recorded on a multitrack recorder (or sample CD tracks bounced over to a multitrack). Try some of these techniques, and you'll create drum sounds that are as unique as a fingerprint - even if they came from a sample CD. Editing parameters in real time lets you "play" an effect along with the beat. This is a good thing. However, it's unlikely that you'll be able to vary several parameters at once while mixing the track down to a loop, so you'll want to record these changes as automation. Hardware signal processors can often accept MIDI controllers for automation. If so, you can sync a sequencer up to whatever is playing the tracks. Then, deploy a MIDI control surface (like the Mackie Control, Novation Nocturn, etc.) to record control data into the sequencer. Once in the sequencer, edit the controller data if needed. If the processor cannot accept control signals, then you'll need to make these changes in real time. If you can do this as you mix, fine. Otherwise, bounce the processed signal to another track so it contains the changes you want. Use no automation at all. In this case, you can send the output through a mixer and bounce it to another track while varying the parameter. This can require a little after-the-fact trimming to compensate for latency (i.e., delay caused by going through the mixer then returning back into the computer) issues. 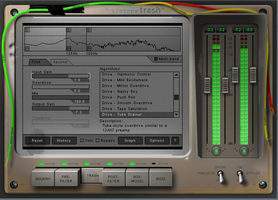 For example, with VST Automation (Fig. 1), a plug-in will have Read and Write Automation buttons. Fig. 1: Click on the Write Automation button with a VST plug-in, and when you play or record, tweaking controls will write automation into your project. If you click on the Write Automation button, any changes you make to automatable parameters will be written into your project. This happens regardless of whether the DAW is in record or playback mode. In many cases, you want any effects to be in parallel with the main drum sound. For example, if you put ring modulation or wah-wah on a kick drum, you'll lose the essential "thud" that fills out the bottom. With a hard disk recorder, parallel effects are easy to do: Copy the track and add the effects to the copy (Fig. 2). Fig. 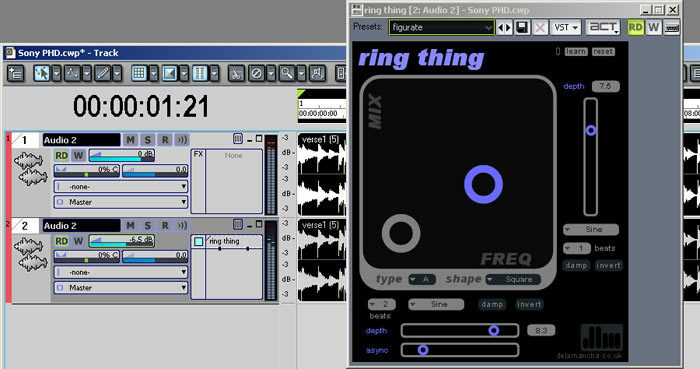 2: Ring Thing, a free download from DLM, is processing a copy of the drum track. 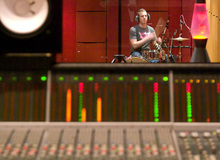 The processed track is mixed in with the original drum track at a lower level. With a hardware mixer, it's also not hard to do parallel processing because you can split the channel to be processed into two mixer inputs, and insert the effect into one of the input channel strips. Okay, we're set up for real time control and are playing back some drum tracks. Here are some of my favorite nasty drum processors. Ring Modulator. A ring modulator has two inputs, for a carrier and modulator. The output provides the sum and difference of the two signals while suppressing the originals. For example, if you feed in a 400 Hz carrier and 1 kHz modulator, the output will consist of a 600 Hz and 1.4 kHz tone mixed together. Most plug-in ring modulators dedicate the carrier input to an oscillator that's part of the plug-in, with the track providing the modulator input. A hardware ring modulator - if you can find one - may include a built-in carrier waveform, or have two "open" inputs where you can plug in anything you want. 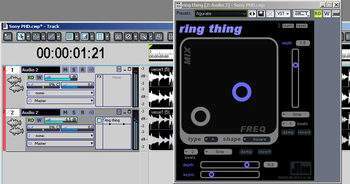 The ring modulator produces a "clangorous," metallic, enharmonic sound (sounds good already, eh?). I like to use it mostly as a parallel effect on toms and kick; a snare signal, or room sounds, are complex enough that adding further complexity usually doesn't help. Having a steady carrier tone can get pretty annoying (although it has its uses for electro-type music), so I like to vary the frequency in real time. Envelope followers and LFOs - particularly tempo-synched LFOs - are good choices, although you can always tweak the frequency manually. With higher frequencies, the sound becomes kind of toy-like; lower frequencies can give more power if you zero in on the right frequency range. Envelope-Controlled Filter. This is another favorite for individual drum sounds. Again, you'll probably want to run this in parallel unless you seek a thinner sound. High resonance settings make the sound more "dinky," whereas low resonance can give more "thud" and depth. For hardware, you'll likely need a stomp box, where envelope-controlled filters are plentiful (the Boss stomp boxes remain a favorite, although if you can find an old Mutron III or Funk Machine, those work too). For plug-ins, many guitar amp sims have something suitable (e.g,, the Wah Wah module in Waves GTR Solo; see Fig. 3). Fig. 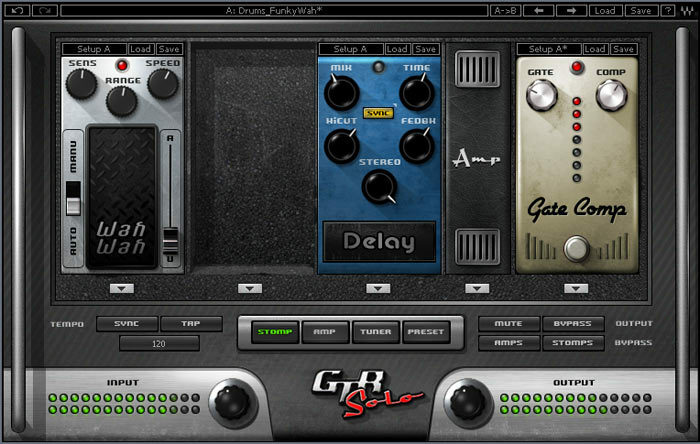 3: This preset for Waves GTR Solo adds funkified wah effects to drum tracks. The Delay adds synched echos, the Amp module adds some grit, and the Compressor at the output keeps levels under control. Distortion. Adding a little bit of grit to a kick drum can make it punch through a track, but I've also added heavy distortion to the room mic sound while keeping the rest of the drums clean. This "muddies up" the sound in an extremely rude way, yet the clean sounds running in parallel keep it from becoming a hopeless mess. Distortion doesn't do much for snares, which are already pretty dirty anyway. But it can increase the snare's apparent decay by bringing up the low-level decay at the end. Guitar amp distortion seems particularly useful because of the reduced high end, which keeps the sound from getting too "buzzy," and low end rolloff, which avoids muddiness. Guitar amp plug-ins really shine here as well; I particularly like iZotope's Trash (Fig. 4), as it's a multiband (up to four bands) distortion unit. Fig. 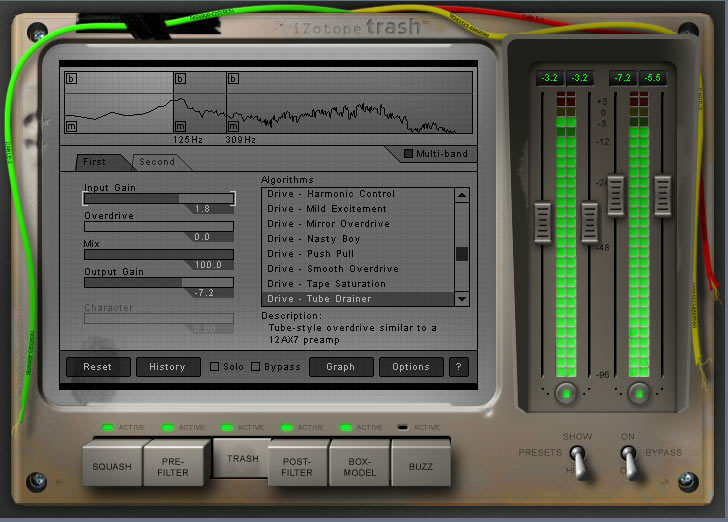 4: In this preset, iZotope's Trash is set up to deliver three bands of distortion. This means you can go heavy on, say, lower midrange distortion, while sprinkling only a tiny bit of dirt on the high end. It's also good for mixed loops because multiband operation prevents excessive intermodulation distortion. Feedback. And you thought this technique was just for guitarists...actually, there are a couple ways to make drums feed back. For hardware, one technique is to send an aux bus out to a graphic equalizer, then bring the graphic EQ back into the channel, and turn up the channel's aux send so some signal goes back into the EQ. Playing with individual sliders can cause feedback in the selected frequency range, but this requires a really light touch - it's easy to get speaker-busting runaway feedback. Adding a limiter in series with the EQ is a good idea. My favorite feedback technique uses the Ohm Force Predatohm plug-in, which was already shown in Fig. 1. 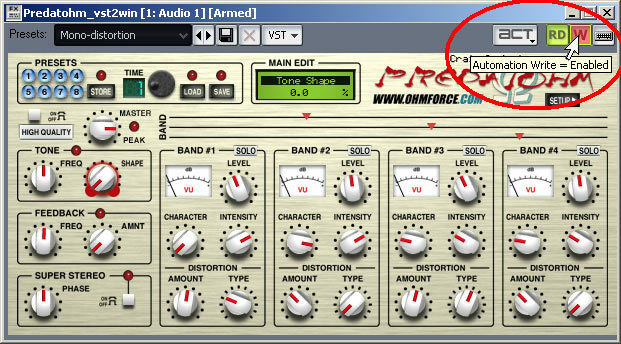 This is a multiband distortion/compression plug-in with feedback frequency and amount controls. But the killer feature is that all parameters are automatable. You can tweak the amount control rhythmically to give a taste of feedback before it retreats. Similarly, you can alter the frequency with amount set fairly high. As the frequency sweeps through a range where there's lots of audio energy, feedback will kick in - but as it sweeps past this point, the feedback disappears. A vocoder (Fig. 5) is a great processor for drums, as there are several possible ways to use it. Fig. 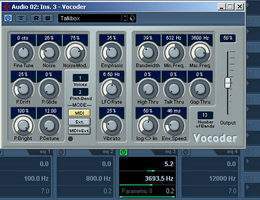 5: The Vocoder included with Cubase SX can provide some cool effects with drums. Cubase 4 doesn't install this automatically, but you can find the plug-in on the distribution disc under Additional Content > Additional Cubase SX Plugins. One is to use the room ambience as the carrier, and a submix of the kick, snare, and toms as the modulator. As the drums hit, they bring in sections of the ambience, which if you've been paying attention so far, is probably being run through some weird effect of its own. Another trick I did was bring in an ambience track from a different drum part and modulate that instead. You can also use the drums to "drumcode" something like a bunch of sawtooth waves, a guitar power chord, whatever. These sounds then lose their identities and become an extension of the drums. 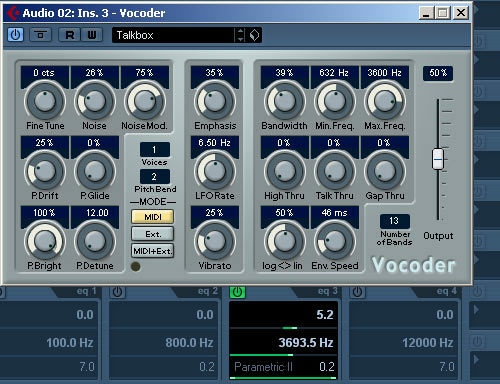 Both hardware and software vocoders are fairly common. Generally the most whacked-out processors come in plug-in form, such as the GRM Tools series, the entire Ohm Force line (their Hematohm frequency shifter is awesome with drums), Waves' tasty modulation effects like the Enigma and MondoMod, PSP's Vintage Warmer (a superb general-purpose distortion device), and too many others to mention here - go online, and download some demos. Also, let's not forget some of those old friends that can learn new tricks, like flanger, chorus, pitch shifters, and delay - extreme amounts of modulation or swept delays can go beyond their stereotyped functions. 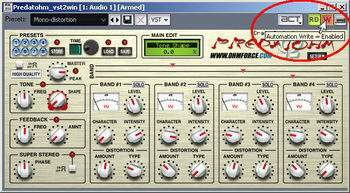 Emagic's Logic is also rich in plug-ins, many of which can be subverted into creating filthy effects. The possibilities they open up are so mind-boggling I get tingly all over just thinking about it. Drum loops played by a superb human drummer, with all those wonderful little timing nuances that are the reason drum machines have not taken over the world, will give your tracks a "feel" that you just can't get with drum machines. But if you add on really creative processing, the sounds will be so electronified that they'll fit in perfectly with more radical instruments synths, highly processed vocals, and technoid guitar effects. So, get creative - you'll have a good time doing it, and your recordings won't sound like million others. What good are all these great new toys if you don't exploit them? Originally published on Harmony Central. Reprinted with permission.